The guests of the Thermenappartements in our aparthotel in Bad Hofgastein live comfortably. 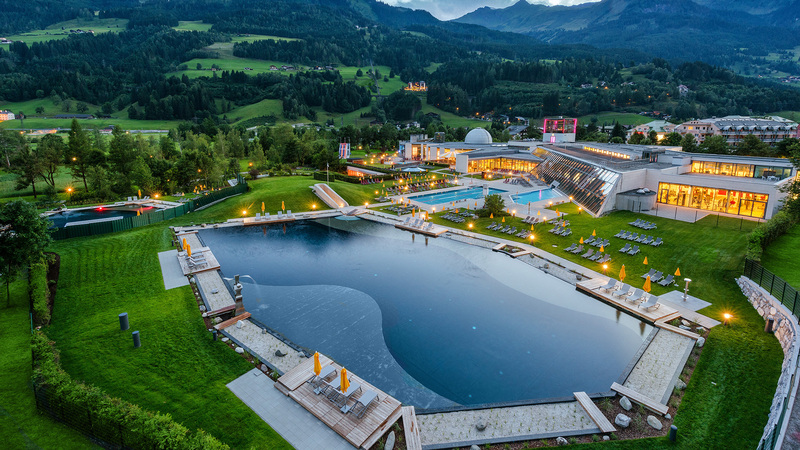 They not only have a direct and free roofed passage to the Alpentherme Gastein, but also stay only a few driving minutes away from the Gastein healing adit. It is situated in the neighbouring village of Bad Gastein, hardly 8 kilometres from Bad Hofgastein. The natural radon healing adit reaches as far as 2,500 metres into the mountain. The microclimate in there combines a high humidity, warmth and radon-rich air. Therapeutic stays in the Gastein healing adit of about one hour each effect a long-lasting pain relief, immune stabilisation and a reduction of medication for up to one year. Every year, the world-famous therapy treatments in Gastein attract guests from all over the world who suffer from rheumatoid inflammatory diseases of the musculoskeletal system, respiratory illnesses and skin diseases. The therapy usually lasts two to four weeks and includes not only treatments in the healing adit, but also thermal baths, therapeutic gymnastics, massages or physiotherapy. It leads to a natural cure with immediately noticeable effects. As a guest in the Thermenappartements of our aparthotel you will enjoy the whole range of Gastein treatments in a relaxed way. For you literally live right in the centre of the action and can therefore focus fully on your recovery. The therapy sessions in the healing adit take place several times a day at fixed hours with the train. The starting point is the Kurhaus in Badgastein where there are also the quiet rooms for the necessary relaxation phase. In the Kurhaus you will also get all information on the process of natural healing, also the medical spa examinations will take place here. Your health holidays in the Gastein Valley will be completed by the therapy centre in the Alpentherme right next to the Thermenappartements that is accessible for you via the heated passage. The two on-site therapy stations offer enough space for various regenerative treatments and for the rehabilitation training. Also here, the radon-rich thermal water unfolds its healing effect. We will be happy to give you comprehensive information on the natural healing in the healing adit of Gastein and reserve one of the top modern Thermenappartements of our apartment hotel in Bad Hofgastein for you and your company. We are looking forward to your enquiry!